M&V Limousine is the choice of many business professionals because we understand the need for top business people to have the highest level of service at all times helping the corporate client with a professional at your service. 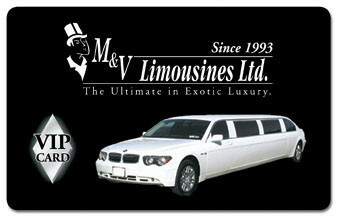 Allow us to show you how being part of our family as a VIP member you, as well as your staff members and family, can enjoy VIP benefits and VIP service as an M&V Limousine VIP Corporate or personal Card member. Employer gets credit whenever one of their employees uses the service and is redeemable in discounts for the company or personal account. Employees can take advantage of the same discounts of the group as a whole. Complimentary water, soft drinks, and alchoholic beverages as well. 1,000 pionts equals a free one way trip to the airport or one hour free for a night out in any of our standard limousines up to 14 passenger. 2,000 points = Free round trip airport or 2 hours free in one of our standard limousines up to 14 passenger. 7500 points= Two free nights on the town for eight hours or a night out on a SUVmousine for 12 hours. 10,000 points= A free night out in any vehicle you like with a complimentary bottle of moet champagne. Limousine can be kept out for as long as you like.